February is National Children’s Dental Health Month and the perfect time for parents to teach their children good oral health habits. Here are five areas to focus on when helping young kids learn how to take care of their teeth. 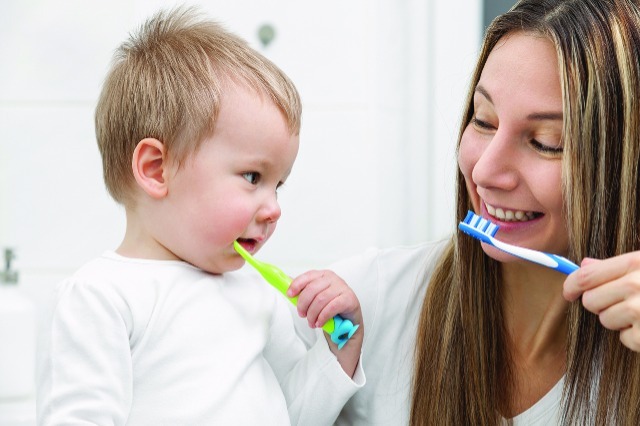 Make sure your kids brush their teeth twice a day, for two minutes (timers are helpful). Form a routine by getting them to brush at the same time every day. Make sure your child flosses too. Note, however, that flossing the conventional way can be difficult and discouraging for kids. Try kid-friendly flossers, which are easier for kids to handle and come in different shapes, colors and flavors. Make brushing fun by letting your kid choose their own toothbrush (just make sure it’s a suitable size and soft-bristled) as well as a favorite toothpaste flavor (so long as it’s a toothpaste approved by the American Dental Association). Bring your children to the dentist at least once every six months for cleanings and checkups. If your kids aren’t quite as happy about these dental visits as their teeth are, you might reward them with a fun activity afterward. Get your kids excited about caring for their teeth by doing fun activities that promote good oral health habits. Visit the American Dental Association’s consumer website (mouthhealthy.org/toothteam) to find printable activity sheets for your child to enjoy. By teaching your kids to practice good dental habits from an early age, you’re setting them up for a lifetime of happy, healthy and radiant smiles.